While walking through an arts & crafts supply store, we stumbled upon this skull-shaped jar. It came with a screw-on lid and straw and so was meant to be used as a sipper cup, but we just knew it could be something more. We love decorating for Halloween, so without even knowing what we would use it for, we snatched it off the shelf to start brainstorming. It wasn’t long before we thought of converting it into a soap dispenser. It’s perfect for your Halloween party decor, as a host gifts, or to put the finishing touches on your Seasonal Product display. 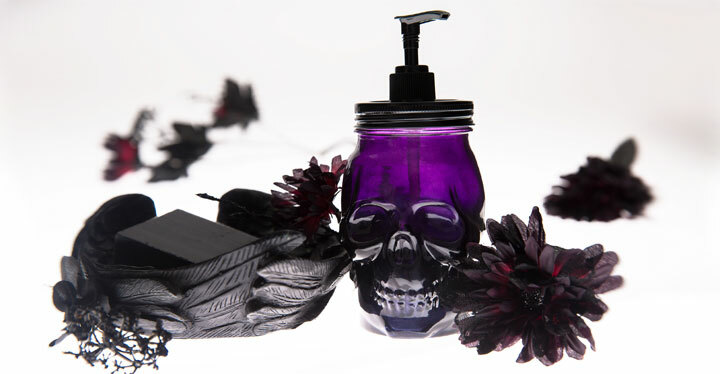 Sure there are plenty of DIY glass soap dispensers online, but none as cute as a skull-shaped one! I will add a link to the store where we purchased below. This is a simple project that will surely catch the attention of customers who love Halloween. 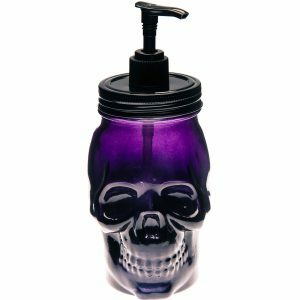 Adding Seasonal decor is a great way to get a customers attention and this Halloween Skull Soap Dispenser is a fun, easy way to add a bit of excitement to your displays. Also, be on the lookout for other Fall or Halloween type glass jars. We have seen everything from pumpkins to witches used as jar shapes. The same technique I describe can be used for any jar that can be sealed with a screw top lid. Lid material may vary, some lids you come across will be metal, others may be plastic. Use an appropriate method to drill or puncture the hole through the lid. Find the center of the lid and mark it. Drill or poke a hole slightly wider than the straw, centered on your mark. Insert the pump, and hot glue the seam where the pump and lid meet, and let cool. Cut the dip tube at an angle, so it barely touches the bottom of the jar. Fill with your favorite Liquid Hand Soap or Lotion, preferably one of ours!